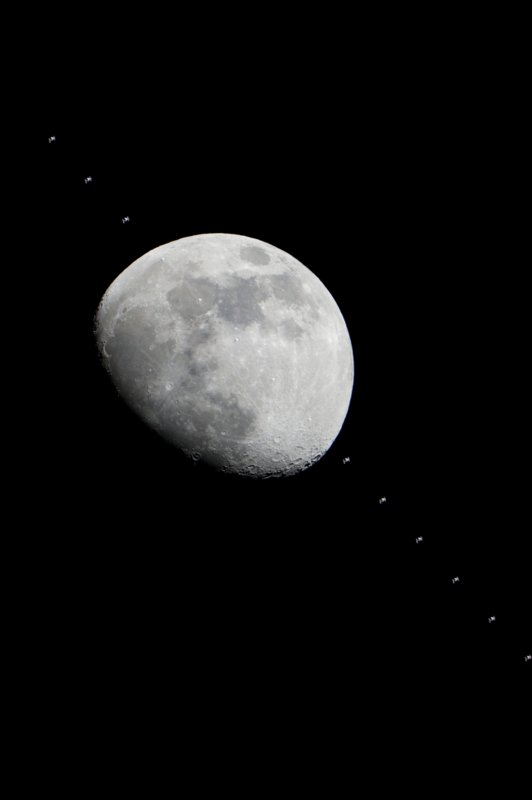 Two photographers have snapped spectacular portraits of the International Space Station streaking across the night sky, catching the orbiting lab crossing the moon and slipping by Jupiter. NASA photographer Lauren Harnett captured images of the moon at the exact moment that the space station passed across its face in what scientists call a “transit.” Harnett took the photos on January 4 from NASA’s Johnson Space Center in Houston. In Harnett’s photos, the moon appears in crystal-clear detail, and the shape of the Space Station‘s huge solar arrays and backbone-like main truss can be recognized. And on January 5, photographer Mike Killian spotted the space station from central Florida as it passed near the bright planet Jupiter.